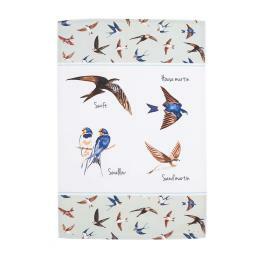 You may be lucky and have house martins nesting on your house already. If not, you can try to attract them by making your own artificial house martin nest. A good place to build a nest. The right materials to build it with. Plenty of food for hungry chicks. House martins only eat insects they catch on the wing, so you cannot attract them by putting food out for them in the same way as you would attract other birds. But, because their nests are made almost solely from mud, a nice muddy pool or puddle may attract them to build near you, especially during a dry spell. Another way to encourage them is to put up house martin nest boxes (nest cups). You can buy these ready made through many bird food suppliers and garden centres, or you can make your own. Nest cups don't guarantee that martins will nest, at least in the first year, but since house martins nest in colonies, the presence of a nest may encourage other birds to build their own alongside. Find out more about house martins. Droppings tend to build up beneath house martin nests, so don't fix nest cups above a doorway. A shelf about 25cm wide fixed about 2m below the nest will catch the droppings if they cause a problem. House martins often carry parasites such as feather mites. These are normally harmless to the birds, and do not affect people, but they can be a nuisance if a nest is built just above a window. A little pyrethrum applied just around the nest (but away from the nest hole) will prevent the parasites leaving the nest. Never spray insecticide into the nest. Once you have fixed the nest cups, it is important to let the birds nest in peace. House martins are fully protected under the Wildlife and Countryside Act 1981, which makes it an offence to kill, injure or take an adult bird, or to take, damage or destroy the eggs, young or nest of a house martin whilst it is being built or in use. Make sure that you replace any artificial nests to exactly the same spot where they came from house martins are very particular about the exact location of their nest. 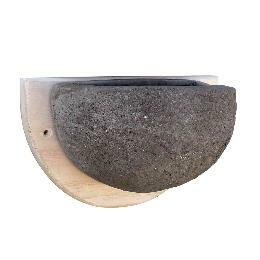 To make your own nest cup for house martins you will need some exterior gap-filler or a mixture of cement and sawdust, and a mould to make the nest the right shape. A child's plastic ball measuring about 18 cm across is ideal. If you have to buy one, choose a cheap, smooth and shiny one without a bladder. One ball will make four moulds. 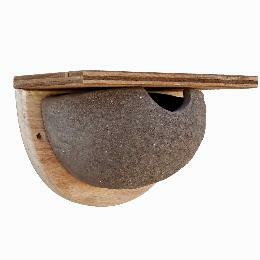 For each nest cup, you will also need a piece of rough, unplaned wood about 30cm by 20cm. To make the mould, divide the ball into equal quarters with a marker pen, and cut carefully along the lines with a sharp knife (Figure 1). Mark and cut out the entrance hole to the nest cup. This needs to be a semi-circle 60mm wide and 25mm deep. Stick pieces of masking tape to the inside of the mould, leaving plenty of overlap (Figure 2). Drill three screw holes in the piece of wood for fixing. If you want to remove the nest easily from the eaves, cup hooks can be fitted in place of screws at this stage. Place the mould on the wood flush with the top edge and stick down the loose ends of the masking tape to attach it. Pack the mould with newspaper to make it firm (Figure 3). Pour a thick layer of filler over the exterior of the mould so it overlaps thickly onto the wood. Smooth the mixture with a knife into an even layer about 1 cm thick (Figure 3). Leave the covered mould at room temperature until it is completely set inside and out. Then carefully remove the ball mould, paper and masking tape (Figure 4). Seal the joint between the inside of the cup and the wood with a worm of wood glue. Allow to dry thoroughly. Plaster the outside of the cup with wet mud and allow to dry before hanging the nest cup (Figure 5). Fix the nest cup under the eaves so it sits flush in the corner. The overhang of the eaves needs to extend far enough to provide the nest protection from the elements. If you have several nest cups, fix them in groups for best results. There is some indication that house martins prefer to nest on east or north-facing walls, but walls in any direction are used.